The sun came out Saturday afternoon, so I decided to do a little railfanning in the late afternoon / early evening. This winter has been severely lacking in sunshine, so I wanted to take advantage of the sun when it showed up. 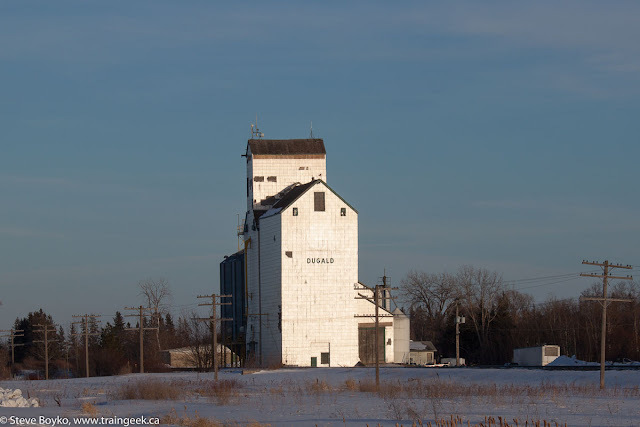 I headed out and decided to take the Perimeter Highway around to the Trans-Canada and then look into Symington. As I approached the CP Emerson sub's crossing over the Perimeter, the lights came on. If I were like most other Winnipeg drivers, I would have gunned it through the crossing. However, I'd rather not get hit by a train (#safetyfirst) so I stopped and the gates came down. Like any good railfan, I had my camera sitting on the passenger seat, ready for action. I lowered the passenger side window and shot the approaching northbound train. The power was unremarkable but it was nice to catch it at just the right time. 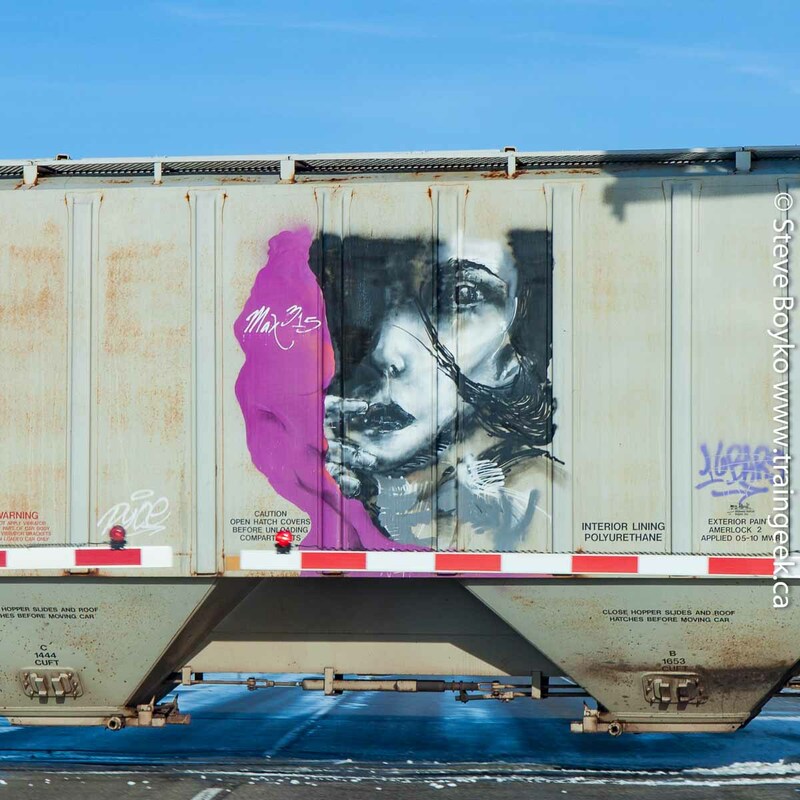 I really don't like vandalism like this, but wow - great art. After the train passed, I drove up to the Trans-Canada and exited. There was nothing in sight to the south on the CN Sprague sub, so I went north toward Symington. 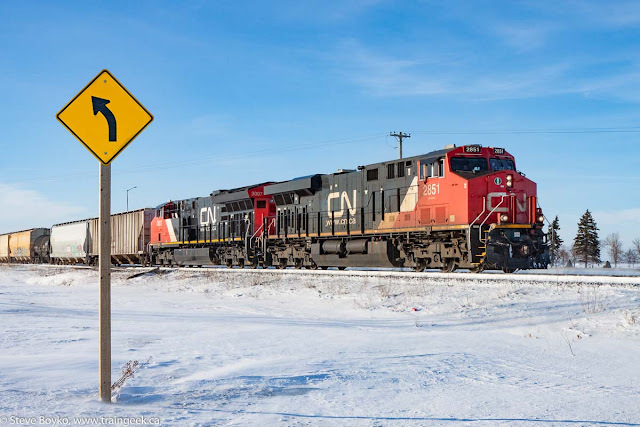 I saw a CN train was pulling up to Navin, although they had a red light so they couldn't proceed yet. As I watched, a CN truck pulled up to the signals, presumably to inspect the train when it got its chance to leave. No turns ahead on the CN Sprague subdivision! I waited for five or ten minutes but they weren't leaving, so I left instead. As I approached Symington I saw they were on their way. There was a DPU locomotive in the middle of the train but I didn't catch the number. Not much was going on at the hump. I drove up to CN's Transcona yard but there was no train there, just cars, so I kept going up to the CP line and on to CEMR. CEMR 4002 was idling away at the head of some tank cars. CEMR 4000 and 4001 were moving around in front of the shop, but the interesting stuff was behind the shop. Two CEFX locomotives were there - CEFX 6056 and CEFX 6057. Both are SD38-2 locomotives, apparently renumbered and relettered back in June 2015. 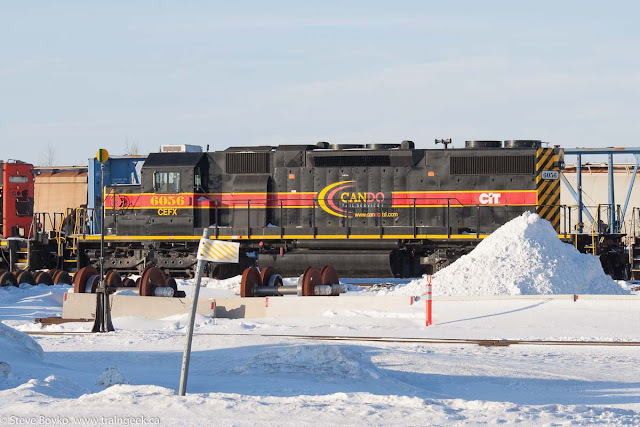 These are ex Iowa Interstate locomotives, now with a Cando logo on them. Cando or CEFX? Who knows? Also on the property are two Railink locos, CCGX 1808 and CCGX 1755. 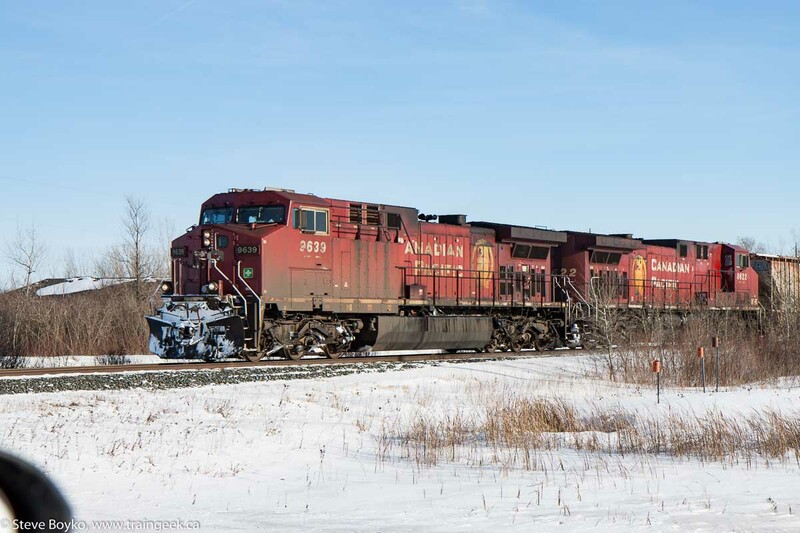 A little Googling showed that these locomotives were working on the Barrie-Collingwood Railway before that more or less went dormant. Apparently they sat in Utopia, ON for a few years before being picked up by CP this past May. I don't know how long they've been in Winnipeg, as I haven't been by CEMR for quite a while. After photographing what I could see from public property, I carried on south to the CN Redditt subdivision and headed out toward Dugald. The road was... icy... so I was being careful. I arrived in Dugald and took yet another photograph of the grain elevator. One thing I did spy with my little eye was a green signal wayyyy in the distance. 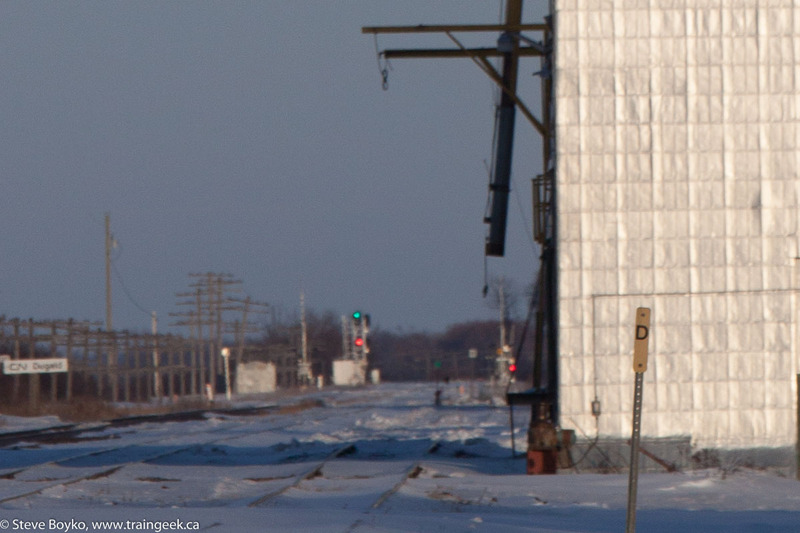 That meant a train was cleared to head east out of Winnipeg. I headed back toward Winnipeg, keeping one eye on the track to my right and at least one on the icy road. 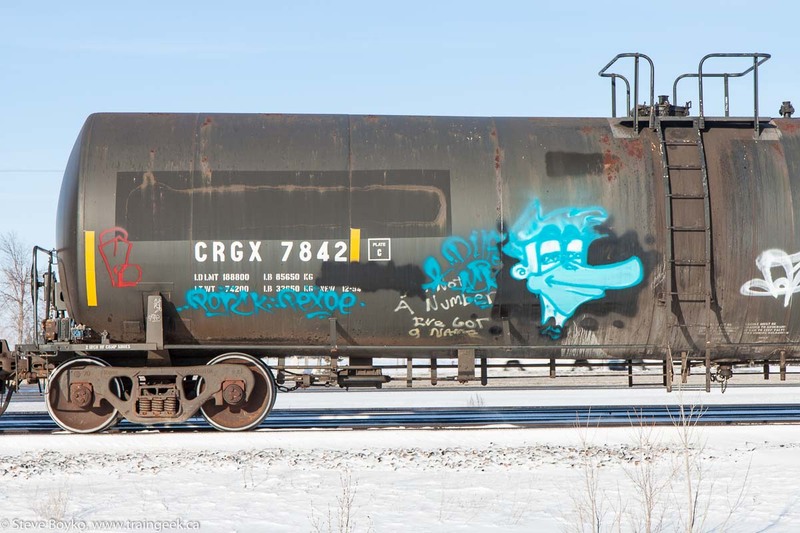 I didn't see a train until I crossed the Perimeter Highway, and then I spotted the train picking its way through the Transcona yard. I found a safe place to turn around and got ahead of it. 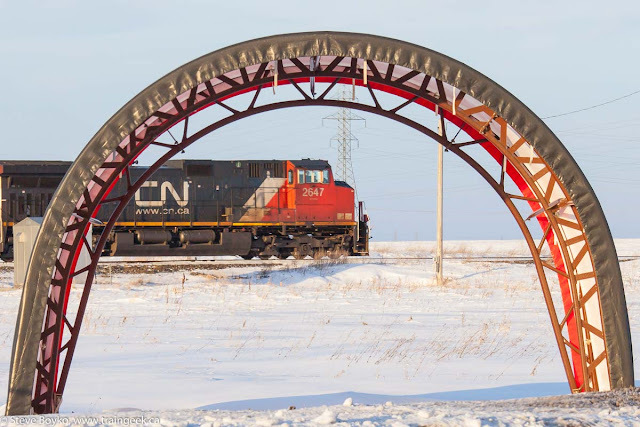 I decided to get a little artsy with this nicely placed shelter to frame up CN 2647 as it led the train out of Winnipeg. That was the end of the day's railfanning... not a bad outing. Nice to see those Barrie-Collingwood units still around and kicking. I spent a few years going to high school in Collingwood and would occasionally see them when the bus from the beach crossed the tracks some days. Figured they were long gone as it seemed like that line has been in limbo forever. 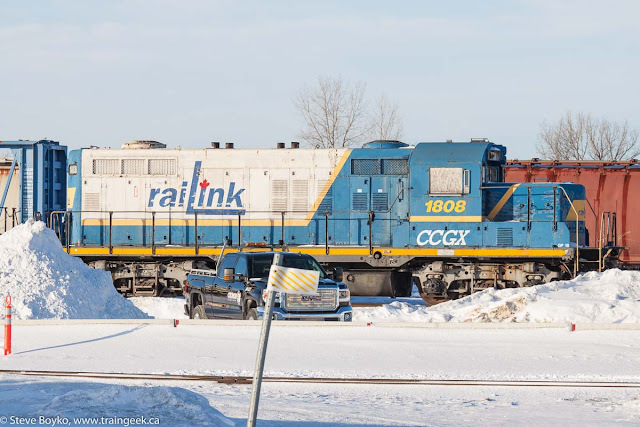 The ex-RLK 1755 and 1808 never saw service on the Barrie Collingwood. They were towed out of Hamilton, and were stored outside beside the shop at Utopia for about 2 years before being sent to the CEMR.